Cuil, a newly released search engine, is extremely interesting. I love the multiple column approach (perfect for today’s widescreen monitors), and the idea of sorting by relevance rather than popularity (even if it’s a total pipe dream) is something I can get behind. I’m happy to find that it’s a lot simpler than Google, too, which is great. Google is easy, but Cuil is way easier (and more helpful when it comes to constructing queries). Aside from the fact that the link (and as a result their index) is woefully out of date (I redesigned the blog back in February, which was when I changed my link structure), I’m curious how that image got associated with Dirt Man. It’s clearly some sort of clothing accessory, but aside from the fact that it’s an image that has never been on my servers, why on earth would it be associated with my site? I don’t sell clothing. I don’t even like clothing. Well. It’s nice when it keeps off the rain, I suppose. I want to love Cuil, but it definitely has some kinks to work out. 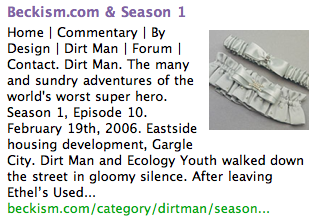 In other news, the last time I updated Dirt Man was February 2006. Jesus. No wonder no one ever reads it.